We’re investing in our airport lounges as part of a multi-year commitment to refresh and expand our portfolio. Here’s a preview of what’s coming to an Alaska Lounge near you. Meals for purchase, starting at just $8. You can buy fresh, filling, high-quality and affordable food to enjoy in the lounges or take to-go. This is in addition to our complimentary bites and beverages (more detail below). Please excuse any disruptions as we complete these renovations. Preliminary renderings of the renovated Portland lounge. Get ready for the new Alaska Lounge in Seattle. At over 15,800 square feet, our newest flagship lounge has it all. 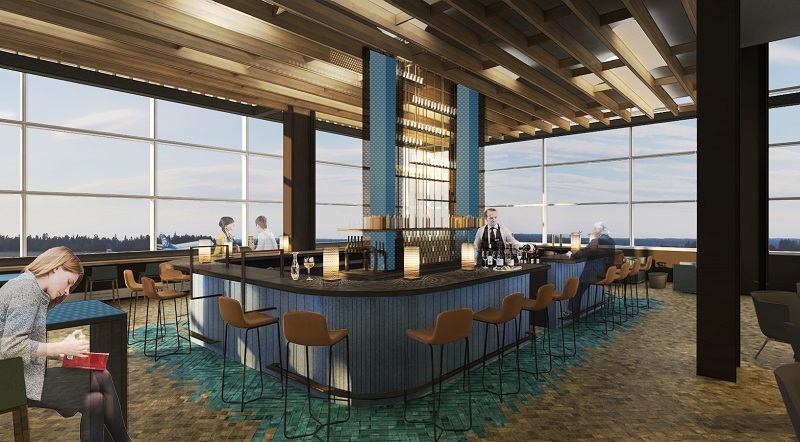 Prepare to relax by the grand fireplace or sip a local brew at the spacious bar while taking in the best runway views at Sea-Tac. 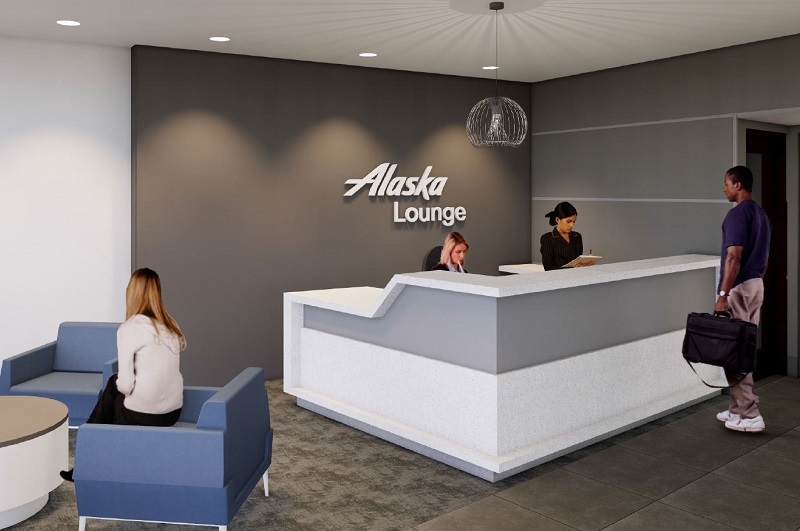 In partnership with Graham Baba Architects, Alaska Airlines designed this lounge with the goal of creating a warm, relaxing and welcoming space that will make you want to arrive early to the airport. The lounge is scheduled to open during the first half of 2019 in Sea-Tac’s North Satellite terminal. 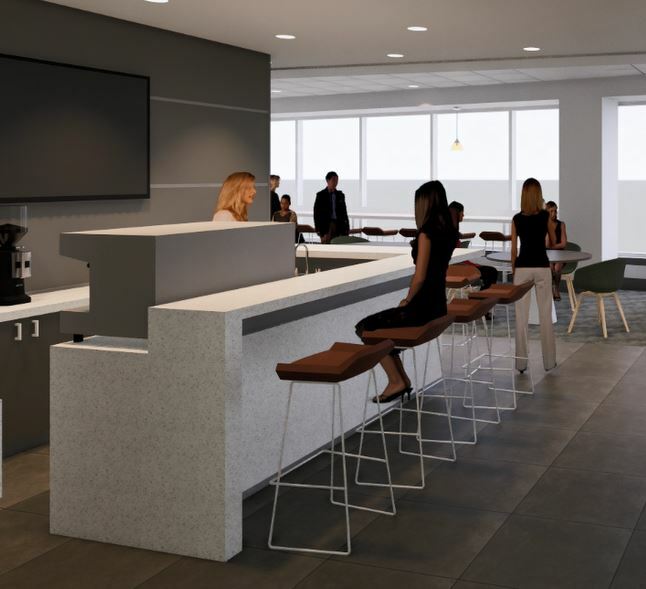 Renderings of the new flagship lounge in Seattle’s North Satellite terminal. We’ve enhanced our food offering. In the morning, indulge in a tasty variety of morning favorites like Greek yogurt, steel-cut oatmeal and freshly made pancakes, paired with our new Toppings Bar. Plus, enjoy hardboiled eggs, scones, bagels and fresh fruit. In the afternoon, choose from a seasonal salad, new hearty soups and rustic breads. And in the evening, enjoy veggies and hummus, cheese and crackers, and more. Plus, enjoy snacks, fresh fruit and, of course, cookies all afternoon and evening. Thirsty? Take a sip of our new Teavana teas – coming soon to all lounges. For the 21+ crowd, we’re introducing new West Coast wines, local brews and custom-crafted cocktails. Looking for something a bit more filling? Try one of our new meals for purchase, starting at only $8. Choose from an egg and brioche sandwich, asparagus + goat cheese omelet, flatbread pizza, chicken pesto panini or a Korean rice bowl. Enjoy in the lounge or to go. Available in Seattle (Concourse C), Los Angeles and New York. Coming soon to Portland and Anchorage. Fresh bites, meals for purchase, and local brews. Never experienced an Alaska Lounge? You can access our lounges by purchasing a membership or day pass. You are also welcome to visit if you’ve purchased a first class seat. 105 comments on "Prepare to step into our stepped-up lounges"
I have been extremely disappointed in the Alaska lounges recently. We have been Boardroom members for many years. Lately it seems as though there is a limited amount of food and can hardly find a seat to sit in. Last few times in Seattle they were out of soup and salad. We also used to know many of the employees and now we know hardly any of the new ones. It’s just not the same!! That sounds like a frustrating experience, Carol. Our inflight entertainment tablets are available, in all cabins, on most coast-to-coast and Hawaii flights. You are also welcome to bring your own device. Lovely that The Lower 48 will be so galantly treated. Meanwhile on any given night the Anchorage Alaska Lounge is packed in the middle of the night, the time most flights run in and out, with barely a chair, let alone a cushioned one. At least the self-serve pancake machine usually works, and often there is butter. Aleut Aleyeska! i hope they can make that schedule of “first half of 2019” so i can check it out when i roll though SEA in July. I am most excited about the views from the lounge. Delta’s lounge offers pretty awesome views, pretty awesome if Alaska can top that. The meal choices on the flights are very poor and the quality at times is marginal. Also, in the lounges, wish there were similar options without having to pay an additional $8.00. Other lounges seen to offer more choices without charging an additional fee. The lounge is an expensive option and other than a place to relax has minimal benefits given the expense of the annual fee. I am a loyal Alaska flier since 1989 and truly appreciate Alaska airlines but it seems like the lounge offerings and food on the plane could be much better. I agree. I am new to the Alaska Lounge but was disappointed in their limited offerings. My husband and I visited an Iceland Air Lounge and it was spectacular. Night and day comparison. Now to charge an additional fee. Unfortunately I will not be recommending the Alaska Airlines Lounge. I am disappointed and disgusted by the unsanitary way the Alaska Boardroom lounges are now offering food and condiments in bulk. As a frequent traveler and Gold MVP member I try to reduce exposure to cross contamination and illness when traveling so I stay well. I loved that you serve trusted brands and delivered them in individually wrapped/portion control options where I could be most assured someone had not dipped a serving utensil into something else, touched with their hands or recently witness licked the knife and put back in the food-Yuck!. Unfortunately, I took the 3 year membership renewal options this last time. Please, I beg you go back to what you were doing before, what you are doing not is not an elevation of service, but a step backwards. These sound like great changes! I hope there is TV free zone built into the new plans – please! Not all of us want to be yapped at everywhere we go, especially if we want to focus and/or relax. Is there going to be a lounge at Paine Field? Hi Kitara. We’re very excited about Paine Field. Nothing to share at this time, but stay tuned! That would be excellent! I will be using Paine field all the time. Can I book a first flight? Not yet, but we’ll let you know here on the blog when the time comes! I am literally waiting to book my next vacation until I can use Paine Field and not have to make that no-fun drive to Seatac again. All fine and good, but what are you doing for your members who are forced to sit for hours in SFO? Not accceptable to have no solution there yet. Hi Scott. SFO is a high priority and we’re continuing to explore potential lounge spaces. Thanks for your patience! As 75K Flyer I would encourage you to spend some of the quarterly profit introducing meals back to transcontinental flight 3+ hours or more – Delta is – and it is so appreciated by road warriors from Alaska who have little chance to eat well inflight. Work on your snacks and up the protein, healthy options ahead. Yes. I’d love to see some more healthy in-flight food options.